Very few truss rod covers rattle even when loose, but they're all worth a look if a buzz appears to come from the peghead. Some recalcitrant truss rod covers can't be silenced by tightening screws. A little resilient material, even a piece of paper, may be just the thing to keep it from flapping against the peghead. 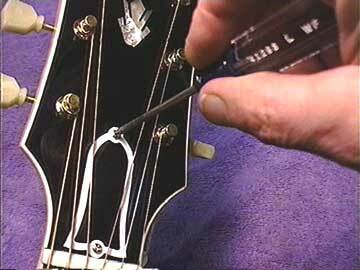 A loose truss rod nut, or, even more likely, a loose washer under the truss rod nut is also a real possiblilty. Even though they're part of the truss rod itself, I'm mentioning them here because they're located under the truss rod cover.